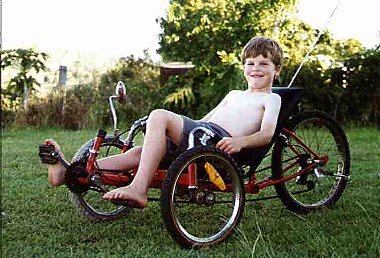 How to build a Childs Recumbent Trike. 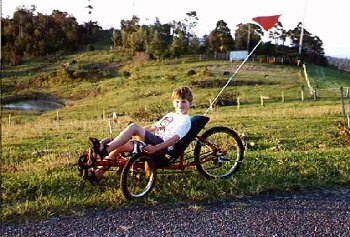 This a description of how to build a Childs Recumbent Trike. 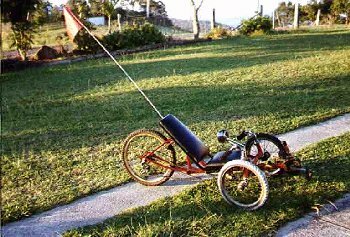 I won't go so deep into the construction of this trike as it is almost the same as the full size version and is all covered there so use this article as a supplement to the other. 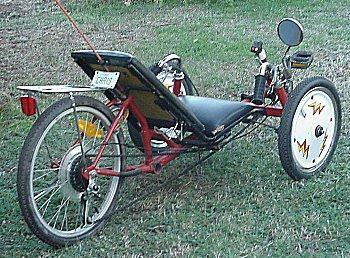 It will help to also refer to the Recumbent Cycle Component Design & Construction page. A shorter wheel base and track. 16" front wheels instead of 20". The rear is still 20". Shorter pedal adjustment and pedal arm length. 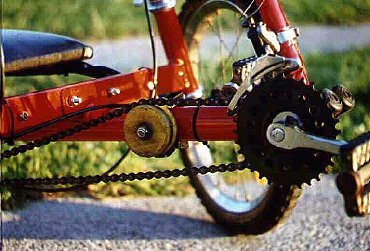 Doesn't seem to need a jockey wheel to keep the chain up in the middle, especially if using a short to medium length derailleur arm. 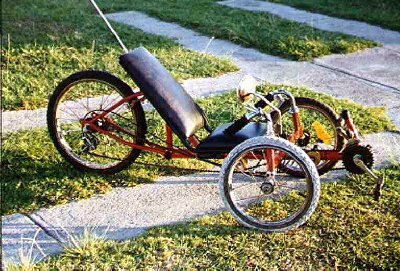 Here is another version of the trike the difference being a wider track and using a 3 speed Sturmey & Archer geared rear wheel and 3 speed front gearing. 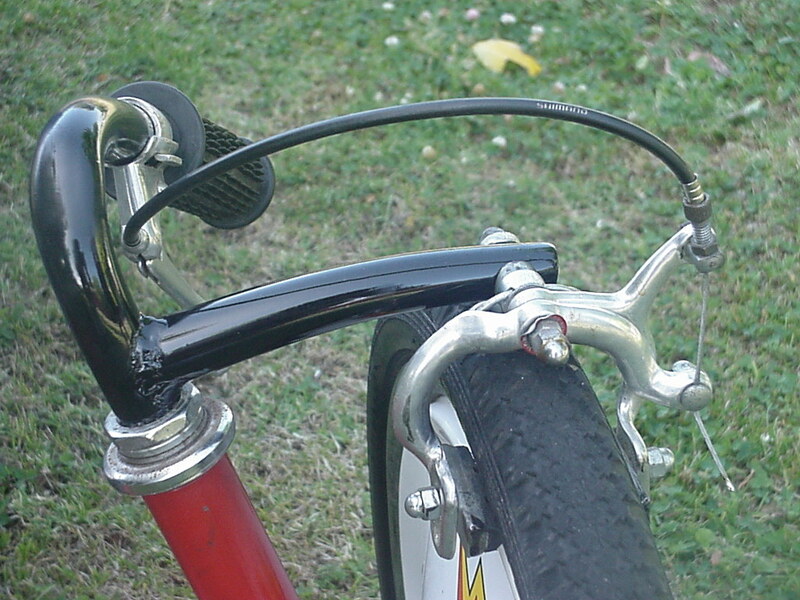 A derailleur was still mounted at the rear even though there isn't a rear cassette to take up the chain tension and the seat U bolted to the main boom for adjustment. This gearing ratio is mostly fine even though it is only 9 speed, maybe just a little too high and so it has been lowered by mounting a larger cog on the back wheel. 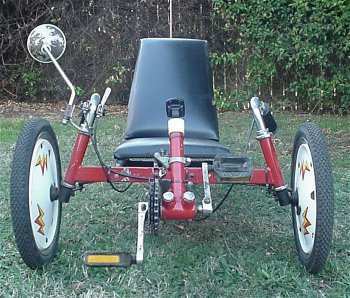 Refer mainly to this page when building this trike. Although this is almost the same design I was surprised how many differences there were and it took at lot longer than I expected to design. There is a limit to how far the pedal system can be pulled back for shorter legs as the riders heels will hit the cross member. Narrowing the track closes the gap between the handlebars and gives less room than before. The kingpin inclination is fairly sharp to cater for the small wheels which also narrows the room for the rider. Because the main boom is considerably shorter than the other, care has to be taken so the front pedal section will slide into the main boom for adjustment. If the crossmember is not set in to the boom the front tube will be able to slide (with some difficulty because the heat from welding affects the tube). The ex seat post tube was bent back 48 degrees to get more weight on the rear wheels. This is important as the rear wheels do lock up fairly easy under braking and can quite easily be spun on grass and even on concrete in the lower gears. Use your frame as a guide as to the angle as there needs to be enough clearance for the rear brake calipers. See diagram 1 for dimensions. 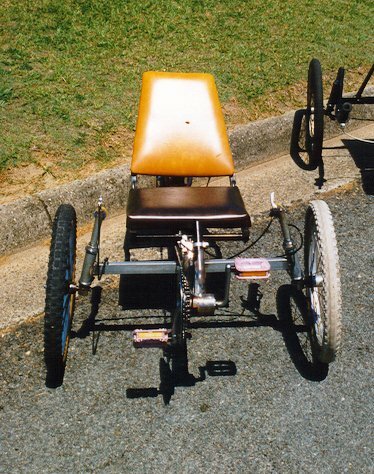 All of seat construction is as before except the rear is mounted over the ex seat tube opening. I cut an ex bike seat mount and welded it to the new seat tube. The gearing needs to be set in the lower range for younger ones so I opted for much smaller than normal cogs on the front. 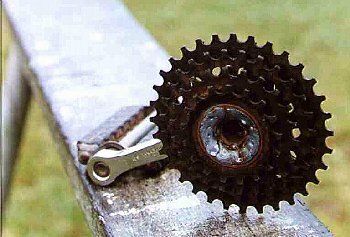 This was possible by using a rear derailleur cassette on the front cranks. see picture 1 & picture . 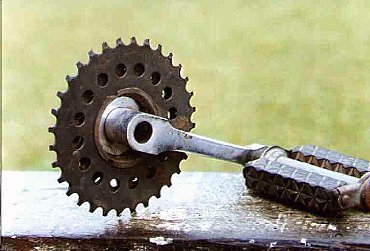 The cog was ground from a bike pedal arm leaving enough left on to fit snugly into the derailleur body with all of it's contents removed. It may be possible to leave the ratchet system in but I don't think it is necessary. There was only enough room for 4 cogs so the others were ground off and the cogs then welded with the largest facing the pedal crank. It may take some time to get this all straight both for sideways movement as well as making sure it isn't elliptical. The cotter pin type was used here but there is no reason why one can use the square splined shaft crank. Be careful when welding:- spot weld the cog in a few places first as it will move out of alignment with the heat. Be careful not to mount the largest cog too close to the pedal arm. The problem here is the front derailleur can't reach across enough to engage the biggest cog and can also hit the crank. A lot of this is trial and error and the problem was fixed easily by turning round the axle as the other side is a little shorter. Some cassettes have the cogs joined together and others have them slide onto a spline with spacers in between. If you are needing to remove a few of these on the spline type there isn't anything to hold them together as they rely on a nut which will need to be ground off. You will have to tack weld the last cog to the body although this doesn't pose a problem (as long as you don't melt the plastic spacers) as it only needs a small amount of weld because the spline does the work under load. If you ask at bike shops they often will give you 2nd hand parts like cassettes (that's where I got my 2 from) if it means they will only throw them away. I do wish I had made a guard between the largest cog and the pedal that extended out further than the biggest cog as in commercial pedals. This would help when it is left unattended and it rolls into hard walls. When the pedals are vertical the part that hits first is the largest cog and the teeth may end up getting bent this way. When using the smaller cogs on the front there is some setting up to do to make the derailleur work. I had to raise the chain at the receiving end with a jockey wheel so the chain wouldn't foul the derailleur. See diagram and picture1 & picture 2. I believe there are derailleurs made for different arm angles so you may be able to find one that fits without this guide arrangement which would be preferable. These use a car exhaust clamp (or 2) for the basis of the material. 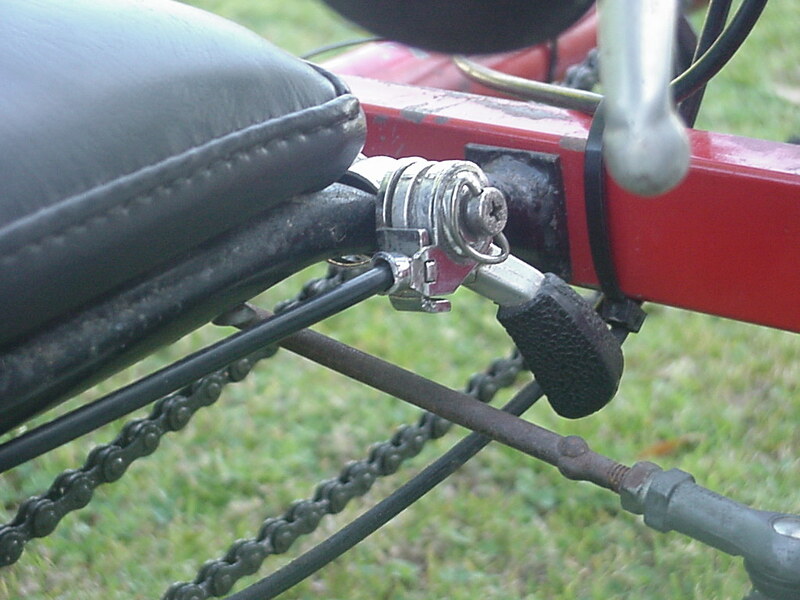 It makes for a bit of adjustment so the chain doesn't foul the seat tubing or front cross-member with the two jockey wheels in place. 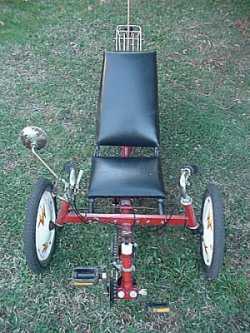 You could also use a Tube clamp for mounting Jockey Wheels and make your own jockey wheels using skate wheels. Refer to this for the dimensions of the cross-member and diagram1 & diagram 2 for the handlebars. 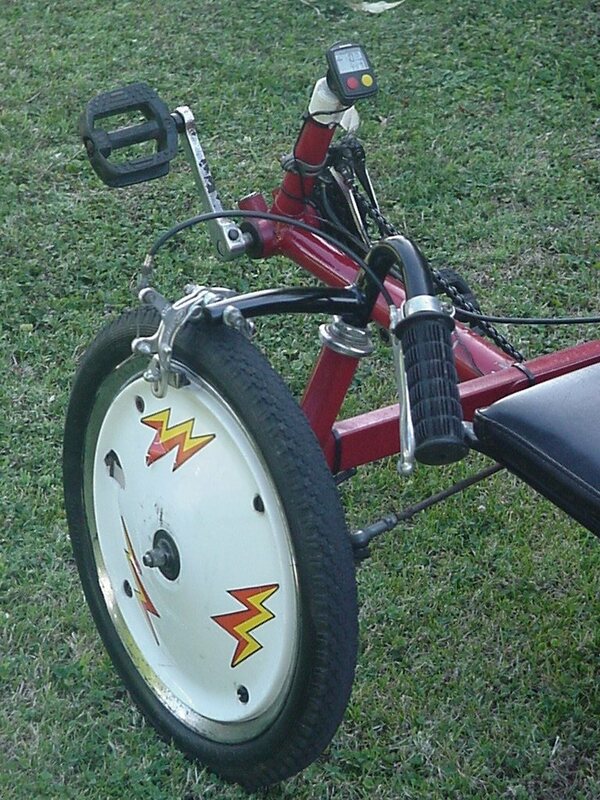 After using the trike for about 4 years I finally decided it really needs better braking. To make this happen I added front caliper brakes onto the front wheels. It would have worked fine to just add soem straight tubing but to make it a little more stylish I used part of some ex 26" bike front forks welded to the handlebars. My first idea was to make them removeable using a clamp but I wasn't sure it would be strong enough to handle all the forces involved. 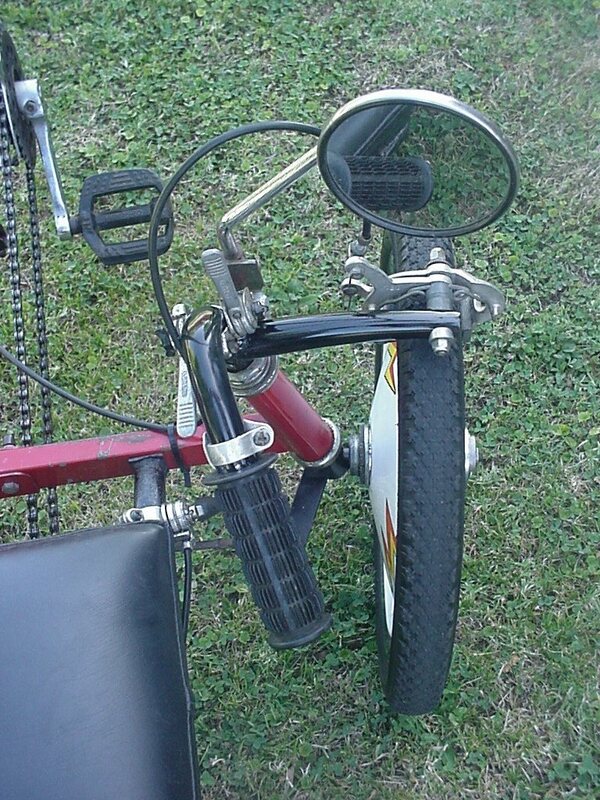 I still wanted the back brake on though and it appeared too hard to have 2 levers on on handlebar so a friction brake lever is now connected to actuate it. Doing it this way also allows one to use it as a hand brake. 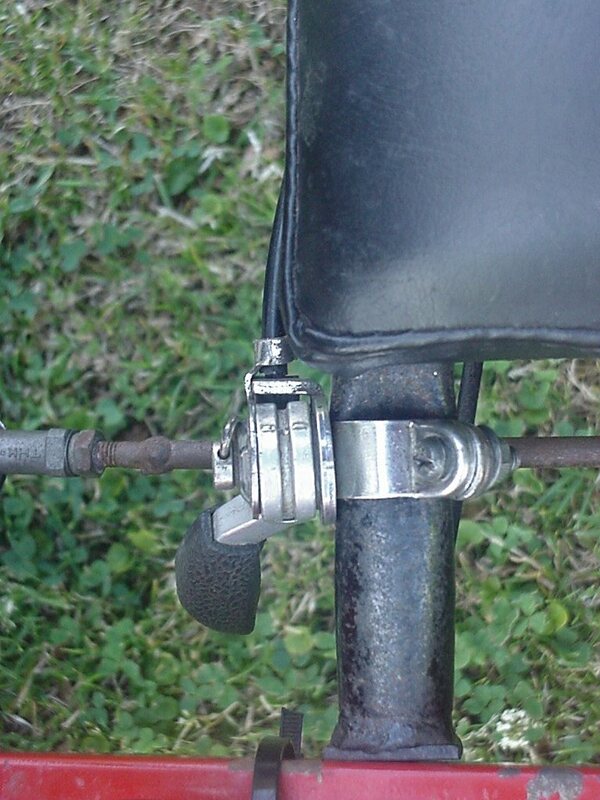 * I've heard from some that if only one lever is used to pull cables for 2 brakes there can be problems with brake balance (unless one fabricated a balancing system) so I decided to have each lever for each respective front wheel brake. 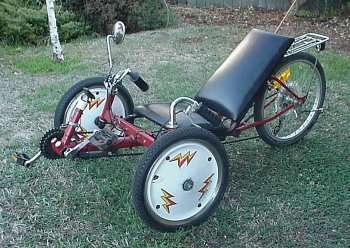 * I've also heard that if the kingpin inclination isn't set up correctly the trike can pull to one side under heavy braking compromising the handling if the settings are too far out. So if you are thinking og going this way be sure to have the kingpin inclination set correctly. * After adding the caliper brakes I realized that it would be easy for the child to get their hand caught between the brake and the tyre if they were careless when riding. I've also noticed my son dragging his hand or some other object he has picked up onto the tyre and this gives a chance of something getting stuck as described. To this end the most safest route I think would be to also include mudguards (fenders). 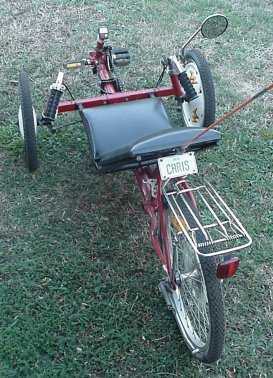 This trike just fits my 6 yr old and can be adjusted for kids maybe up to 16 years I would think. 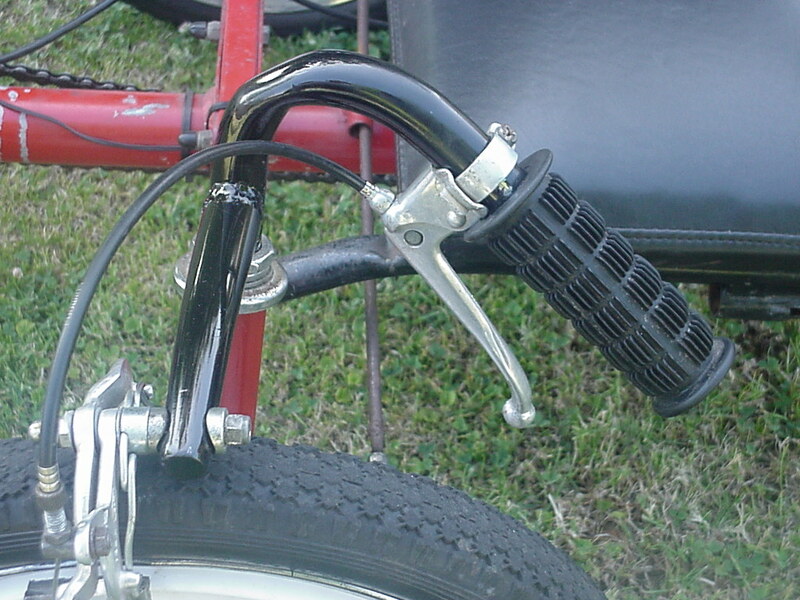 The main limitation would be the width of the handlebars as the front boom is adjustable. It is quite stable being so low and I haven't found it lift a wheel yet. As said earlier there isn't a lot of weight on the rear end but it still seems to have about the same amount of braking as using only the rear on a normal bike. A flag is essential in my view when riding on the road for cars to see it coming. I added a stand on the rear to help with adjusting the gears and it also can be used as a way of stopping it rolling away when parked. 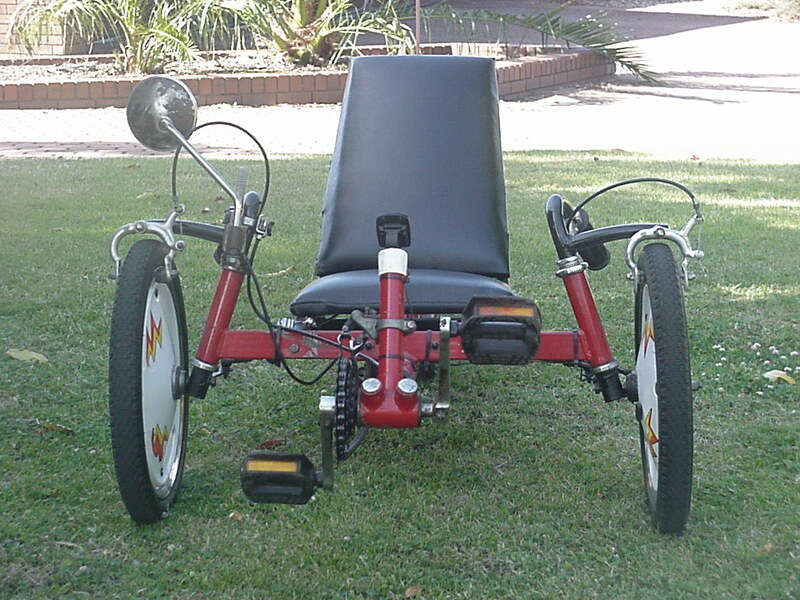 Here shows the comparison between the 2 trikes but is a little hard to see the difference because of the angle of the photo. Seat Angle 121 degrees between back and bottom.